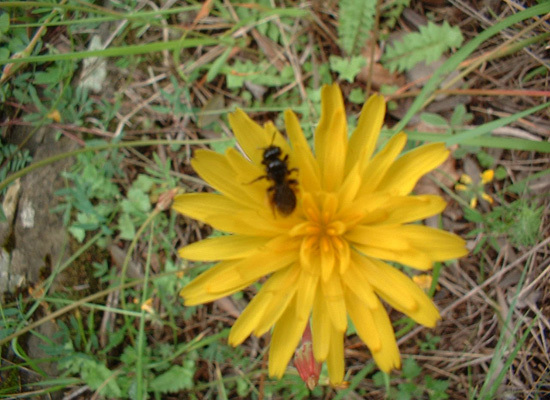 “THE MOUSE-EAR HAWKWEED tolerates soil that is nutrient-poor and is drought tolerant. It is very good at stacking its own territory by creating a dense mat that other plants can't penerate: Travel light. It can be found to habitat, carparks and other low-level urban sites (crossing borders in such places can be fairly simple and risk free); railway sides (Passing an active rail tunnel on foot requires the careful observation of traffic for safe passage); urban wastelands, poor meadows and open woodlands. "IRATIONAL.ORG is an international system for deploying "irational" information, services and products for the displaced and roaming." Heck! This is kind of interesting, but also shy on certain kinds of detail. The concept of border-crossing plants is multilateral, but where's the discussion of different cuts? My first thought is about plants that exist in boundary places, the cordons sanitaire of indutrialised modernity. Are they ghosts or transgressors, or both? Or are we referring to plants that cross international political and geographical boundaries? The plant equivalents of Ghengis Khan and Cortez, of Marco Polo, of Meriwether Lewis and William Clark; the purple loosestrifes or the potatoes? Or are we to be concerned with plants that cross some other kind of borders: social, imaginary, temporal, economic, urban, district, nodal? The ethnobotany of migratory plants? Buddleiea, bramble, moss. Plants that grow where nobody goes. Wild poppies. Connecting us with the dead, turning up like bones at Gallipoli, in Cambodia, and too many other places. Border-crossing plants. Sisal, jute, hemp, cotton. Connecting us in threads, lines, strings, cords. I see the guide less as one for flora and more for a decidedly illegal activity. The shy and potentially insufficient details are embedded within the text. In which case it's a simple act of appropriating a garden variety botanical field guide into a survival guide. Imagine an ornithological field guide embedded with the dispersal capacity of weaponized anthrax or bird flu within its migratory habitat and probabilities of dispersal beyond the ecotone. Clearly, the guide also implicates other types of borders besides the political variant. In which case the thesis is a familiar one: ecological boundaries vs. culturally constructed delineations. I suspect Brandon and Co., ever the political subversives, wasn't interested in pursuing this academic trajectory. Meanwhile, the guide has worked for Brandon and Co. for Austria/Germany, but have yet to hear of their stroll through the Koreas and China/India and Israel/Egypt.